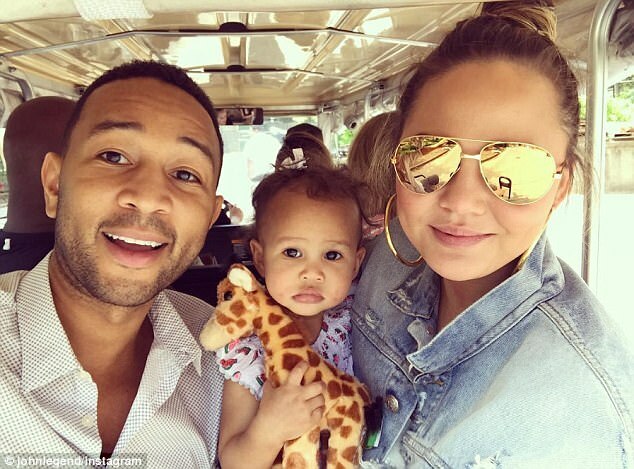 "All of me", one of the most romantic songs of modern times, by the talented John Legend and if you don't know, the inspiration behind it is none other than his beautiful model wife, Chrissy Teigen. People are curious to know about their married life so, in this column, we will be discussing it all. The couple is blessed with a daughter, Luna Simone Stephens and is currently expecting another child. Chrissy Teigen is a proud mommy and wife. She recently shared an adorable video of her spouse and daughter. To know more, keep scrolling. The Lip Sync battle host, Chrissy Teigen is an active social media user and utilizes the platform to share moments with her fans and crack some jokes from time to time. In recent events, the pair were seen on the pre-Grammys gala. But, before heading out the model shared a video of her spouse holding their daughter's hand as they walked downstairs. The mum-to-be captioned the video "My beautiful babies". Teigen flaunted her baby bump at the gala and looked radiant. The couple looked very happy and were seen hand in hand the evening. Now, let's move on to their married life and children. John Legend and Chrissy Teigen first met on the set of Legend's 2007 music video Stereo. The two were not exclusive right away. Teigen admitted that the two hooked up after Stereo shoot. The pair kept in touch while Legend was on tour and eventually started dating. Then, in 2011, Legend proposed to then-girlfriend Teigen during their Christmas trip to the Maldives on a beach and Teigen said yes. The pair went on to get married on September 14, 2013, in Lake Como, Italy. The location was special for the two since it was where Teigen once wished that she would spend rest of her life with Legend. It won't be wrong to say the couple is the definition of relationship goals. Legend is devoted to his wife and it can be seen through his lyrics. The two have been very supportive of each other but with a little twist. Teigen loves to fool around with Legend and we are here for it. You can check it down yourself. The couple has a wicked sense of humor and they pull each others leg for fun. However, the rumor of the couple's divorce started surfacing last year. Chrissy Teigen was quick to slam the rumors and was not very happy about it. She let the publication have a piece of her mind with a post she shared on Instagram. See it for yourself. As for children, the couple had to face hardships. They were not able to conceive due to fertility issue. Teigen even started to consume less alcohol. Then, they tried IVF which worked for them. As a result, Luna was born on April 14, 2016. Legend and Teigen believe the process brought them even closer. Luna has been a wonderful addition to their family. Both the parents are proud of their daughter and share pictures of her on their respective social accounts. In recent events, Teigen has revealed that she is pregnant with another baby. The gender of the baby has not been exposed yet. Legend has been very supportive of Teigen at this time. The couple is more than happy to have another child. John Legend and Chrissy Teigen are a wonderful couple. They have been married for more than four years. Despite, the ups and downs of their relationship, the couple has stayed strong and true to their love.